Porinju Veliyath Apologies to "Dumb Jim Rogers"
In September 2015, Commodities trading guru and hedge fund manager Jim Rogers - chairman of Rogers Holdings Ltd, was in news limelight as he publically admitted that he exited Indian Stocks completely. He made it clear to the market community that his exit is primarily due to the incompetency of the Indian Government and National Democratic Alliance (NDA) government has failed to live up to investors’ expectations. 2. Market may not be good for next two years: Modi is a smart guy, he enjoys good press, and he makes a lot of friends for India. But as an investor, after almost a year-and-a-half, have decided to move on to other places, partly also because stock markets are not going to be particularly good for the next year or two. 3. Rigid Indian Bureaucracy: The government goes from one mistake to another—no matter what the controls are, no matter how much the debt keeps rising, Indian politicians are only looking for scapegoats. India should have been among the world’s greatest agriculture nations—you have the soil, the people, the weather, but it is astonishing that you have not become one—it is because Indian politicians, in their wisdom, have made it illegal for farmers to own more than five hectares of land. What the hell—can a farmer with just five hectares compete with someone in Australia or Canada? Even if you put together the land in all your family, it is still not possible to compete. Much as I love India, I am not a fan of its government. Every one year, they (Indian government) come up with more reasons for me to be less optimistic about that country. Anuj Singhal, the markets editor with CNBC TV18, was not far behind Porinju. He tweeted "Jim Rogers is not only dumb but arrogant, rude and a non worthy. Most networks have banned him but in India, we treat Rogers like god”. 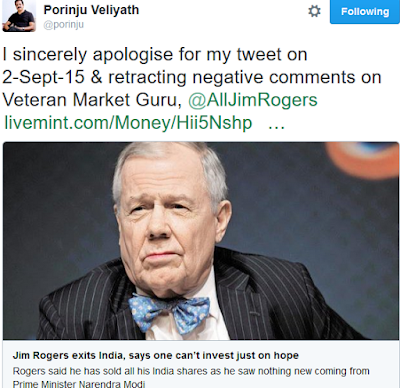 Now, just after 5 months, Porinju genuinely came out and apologized to Jim Rogers. Reasons we all know! !, Things have changed a lot during the last 6 months. From a bull market, we have entered into a bear market territory and from a buy on dip market, we are in a sell on rally market.